(Note: This is a repost from 2015) A few weeks ago, my 5 year old was having trouble falling asleep. I was resting next to him on his bed, waiting for the wiggling to stop, for his eyes to close. It didn’t and his eyes stayed open for 10, 15, 20 minutes. I had him place his hand over his belly to feel his breath and mentioned that when I was a kid, I used to have thoughts flying through my mind at night. He turned to me and said, “That happens to me all the time.” (After weeping silently in my mind that a 5 year old has racing thoughts that keep him up, I gathered my composure.) We talked about how paying attention to your body and breath can help shift you into a lower gear, settle those thoughts, and allow sleep to come. On a mission the next day, not wanting him to have to go through the same anxieties I did as a kid with an overactive worried mind that never seemed to settle down, I went in search of a book that could help me help him start early with mindfulness and self-calming techniques. I hoped for simple exercises, short meditations, fun imagery, effective strategies, and a cd that could guide us through. And…. Every single one of my hopes was answered in this book. It’s beautifully simple with tips and info for parents about mindfulness and soothing cd tracks that guide you through short (4 min+) mindfulness exercises. These tracks are stand-alone- they’re perfect. Simple enough for my 5 year old to listen to by himself, interesting enough that it keeps his attention. After listening to a few tracks over the course of several days, he suggested we do a mindfulness exercise every day. (Joy!) Ten minutes later I was buying this book online. You can’t buy happiness but you can buy this book. Being present in our bodies and teaching our kids to do the same is the happiest of happies. 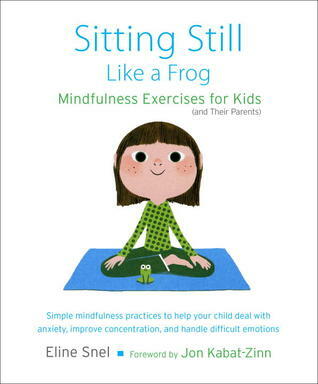 This entry was posted in children's books, featured and tagged mindfulness, sitting like a frog on March 12, 2014 by skylikeme.